Magnetic field lines during an active moment on the Sun. Better forecasts for "all clear" space weather conditions are now available, NASA-affiliated scientists reported today. In recent years researchers have learned much about the Sun's temper, relying on new data from satellites that keep a constant eye on the situation. But many mysteries remain, and forecasts are only about as reliable as weather predictions were in the 1950s, experts say. A new study, detailed in the Astrophysical Journal, reveals a previously unknown aspect to solar eruptions. Active regions on the Sun's surface have specific magnetic orientations. When an electrical current with an opposite orientation climbs to the surface from inside the Sun, solar flares can be produced. 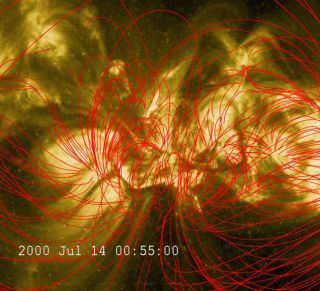 The flares are often associated with coronal mass ejections, which are blasts of charged particles that can cause threaten power grids, aircraft, communication technologies, and space-walking astronauts. Figuring out how the largest flares were produced was a two-step process. "First, we discovered characteristic patterns of magnetic field evolution associated with strong electrical currents in the solar atmosphere," said Marc DeRosa of Lockheed Martin Advanced Technology Center. "It is these strong electrical currents that drive solar flares." Next the group discovered that the regions most likely to produce a flare had new magnetic fields merge with them that were clearly of a different alignment than the current field. "It had to come up in the wrong orientation – different from what already existed – to make a flare," said Karel Schrijver a Physicist at Lockheed Martin Solar and Astrophysics Laboratory. "Those that carried the wrong electrical currents produced flares two to three times more often and had ten times more flare energy." To make the actual predictions, the group compared magnetic maps from SOHO to Sun surface images from TRACE – two satellites that keep a constant watch on the Sun. If actual observations matched up to the computer model of the magnetic fields, then no flares would erupt. "But, if the model doesn't match up with the observation, strong electrical currents are indeed present in this region," DeRosa said. "Strong flares have a better chance of occurring in this region." These predictions can be made with 90 percent accuracy in the two days leading up to the event, according to Schrijver. But more observations and tests need to be done for this to be a truly reliable tool. "We can give a forecast of 'all clear' for a few hours, which is long enough to make an EVA (extravehicular activity)," Schrijver said. While scientists can now better determine whether a solar flare is on the way or not, they still can't tell exactly when it will actually erupt. The flares don't always kick up immediately after the new field merges with the existing one. Instead, it sometimes takes several hours before the electrical currents build up enough to cause a flare. The scientists liken this to predicting avalanches, which occur once enough snow pack has built up. Like avalanches, solar flares may need to reach a certain threshold before releasing their energy. The absence of impending activity provides useful information, however, akin to a forecast of no rain suggesting a picnic would be possible. "All clear" space weather forecasts are particularly important for astronauts planning space walks outside Earth's protective magnetosphere, as would be the case if humans travel to back to the Moon or on to Mars. "I think that the advantage of having an 'all clear' is that you have a factor which you can use in the scheduling of EVAs," said Richard Fisher, director of the NASA Sun-Solar System Connection Division. "This allows you to avoid times that are less fortunate. I believe this will be important as we return to the Moon." Although scientists can determine whether or not a rising electrical current will create a flare, they still do not know what inside the Sun produces the rising current. "There are many ideas, and I think that's the problem. We don't really understand how that works," said Schrijver, adding that this is a goal of future studies. Researchers presented their results in a NASA teleconference with reporters today.